On many occasions, I see rats scurrying through riprap habitat in the intertidal. It’s kind of gross, particularly when you’re climbing through these boulder fields to get to your dive sites. Maybe it is because of this “gross” factor that I don’t usually mention rat sightings when I’m talking about what I do. But the fact is that rats have been an undeniable part of urban ecosystems throughout human history. In the intertidal riprap, they form extensive networks of burrows that I suspect are relatively undisturbed by human activities. What do they eat in their little waterfront colonies? Is it possible that they rely on food resources from the marine environment? Food web from Kurle et al. (2008) of rats in the Aleutian Islands. Rats reduced seabird populations, which reduced predation pressure on grazing intertidal invertebrates, decreasing the abundance of algae. I should say that while I’ve been seeing rats in the intertidal in Seattle for some time, it didn’t really occur to me to ask these questions until a recent conversation with Dr. Bob Paine at the University of Washington. He has been taking note of their presence in the intertidal for some time, and it was based on his suggestion that I began to consider rats as potential predators in urban marine ecosystems. Indeed, there is some precedent for considering the role of rats in marine ecosystems. 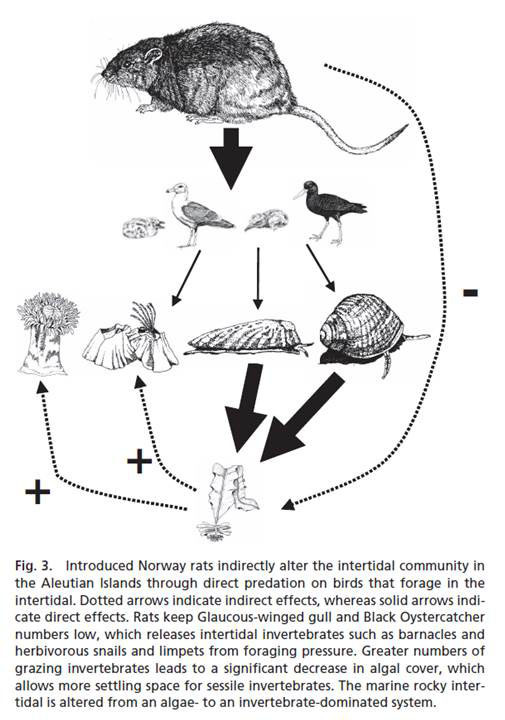 In 1993, Sergio Navarrete and Juan Castilla at Estación Costera de Investigaciones Marinas published a paper documenting predation by invasive Norway rats (Rattus norvegicus) on intertidal invertebrates in a marine reserve (link to Navarrete and Castilla 1993). They found that rats were particularly keen on keyhole limpets and crabs. In a more recent paper, Carolyn Kurle and colleagues documented the effects of predation by Norway rats on seabird eggs and chicks in the Aleutian Islands (link to Kurle et al. 2008). Because seabirds feed on intertidal invertebrates, the presence of rats facilitated greater abundances of invertebrates and less dominance by algae, which invertebrate grazers controlled. While I don’t see a lot of evidence of seabirds nesting in urban settings, the abundance of rats in the intertidal raises the question of how they may be impacting intertidal communities. Limpets and crabs are certainly potential prey items here, as are mussels, seaweeds, and a variety of other types of species. Of course, it is possible that the plethora of food options provided to city rats by humans make intertidal organisms a minimal component of their diets despite how much time some of them may spend in intertidal habitats. For now, we can’t be sure. Time permitting, it’s something I’d like to look at in future work.